Appearance (0-20): This cigar is pretty new to the market, and is a product of Pinar Del Rio. It sports a dark, habano wrapper that appears a bit oily and toothy. The size that I chose was the double perfecto that looks very inviting. 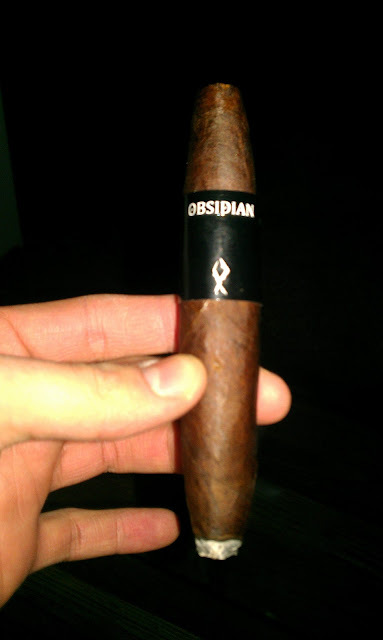 There were no identifiable flaws on the wrapper, and it included a fairly simple band; shiny black, with the name Obsidian and a symbol underneath it. Construction (0-20): From start to finish, there were no issues. Double perfectos can be tricky sometimes when it comes to the burn department. This one burned quite even, and had a very solid ash that held on almost 1 ½”. The ash had a very tight coil burn, and was cool right down to the nub. Overall I was very impressed, given that it was a double perfecto. Strength (0-20): The dark wrapper and band give you the impression that this will be a pretty strong cigar. When you start off, you’ll get the feeling around a medium. Similar to the Flavor profile, the strength will pick up as you progress through the ring gauges of the double perfecto. Overall, I think this one sits in the medium-full range. Flavor (0-20): The flavors were very solid for this smoke. Upon lighting, you’ll find different hints of spiciness. The perfecto shape will give off different flavors as you smoke down the cigar and it hits the different ring gauges. The most notable flavor is deep espresso and cocoa. There are hints of earthiness in various parts, and something that I can only describe is a roasted campfire. It was very robust, and super flavorful. Value (0-20): You can snag these sticks pretty cheap, and the regular MSRP is under $5.00. That is an amazing price for what you’re getting. I’ve smoked a few of these so far, and there have been no construction issues. Great value for a “go-to” flavorful smoke. Additional Notes: Smoked on my porch, paired with a Sam Adams Lager. Overall (0-100): This is another amazing stick for the price. I haven’t had many smokes that are this flavorful, and easily found under $5.00. You can grab these even cheaper in sampler packs and websites (Cbid). Additionally, I hadn’t found another cigar that has the deep, rich espresso taste like this one does---again, for the price. If you have been on the fence about this cigar or haven’t heard of it, grab one and be happy that you did.